In Vienna, you can find Mozart in every imagination incarnation – keyrings, mousepads, tissues and chocolate balls. Don’t be surprised if a “Mozart” comes up to you on the streets – most likely they are promoters trying to sell you concerts; be wary of them as most of the time the standard of the concerts are not as high as you expected. Remember in an earlier post at the Schonbrunn palace souvenir shop where I promised to show you the best place to get your stock of Mirabell Mozart Chocolate Balls? 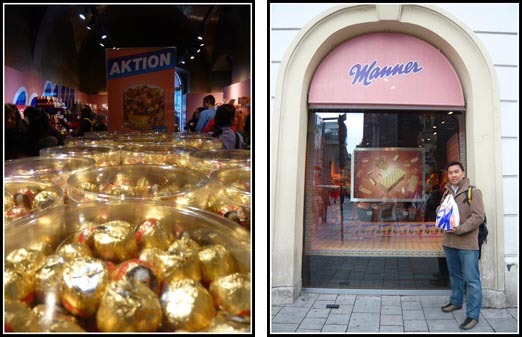 You should get them from Manner shops in Stephenplatz (its just beside the Stephansdom – look for the pink store). Here you can get the Mirabell Chocolate Balls by the tonnes if you want as its definitely cheaper than anywhere else in Vienna. Getting around Vienna is easy with the extensive U-Bahn (Metro-equivalent) and tram systems. The U-Bahn map is also much easier than the London Tube system. It is also cheap as we used a 8-Day Ticket (8-Tage-Karte) which can be bought at tobacco shops around Vienna. Why buy a 8-Day ticket when we are only in Vienna for 2 days? The 8-Day Ticket is valid for 8 days but not necessarily 8 consecutive days. It just means that there are 8 stripes on this ticket. You must validate one stripe of this multi-ride ticket per person and day prior to using public transport. Each strip of the 8-day ticket is valid on the day of validation from 0.00 until 1.00 of the following day. The number of stripes validated must equal the number of persons using the pass during that day. The pass is good for unlimited riding in Zone 100 on the day of validation. i.e. we have 4 persons travelling on the same day thus we validated 4 stripes on the first day. The most common form of transport we took around Vienna is the trams (known locally as Bim after the sound of their warning bell) which looked like red and white metal caterpillars (see picture above). Most trams travel in a loop service and return to their original destination so there’s little chance of getting completely lost. I would suggest that visitors to Vienna take tram 1 and 2 which circle the Innere Stadt in opposite directions along Ringstrasse. This route provide a glimpse of some of the city’s richest architecture e.g. 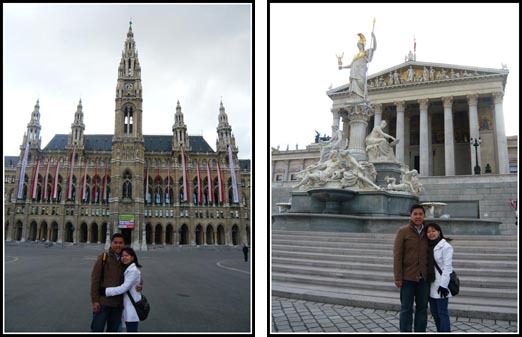 the Rathaus (City Hall) and Parliament. .-= kelvin´s last blog ..Daily happenings – Hehe, this time i am just a bystander. =-. I like Mozart chocolate balls! .-= eunice´s last blog ..Happy 44th Birthday Singapore! =-. I’m not a chocolate lover but I find these Mozart chocolates nice and taste different from the other chocolates which are usually too sweet. I’ve bought some back for my family and friends and they all love the chocolates. I would say it is a MUST buy chocolates/souvenirs when in Vienna. @Fabio – we havent taken this route before – however for an overnight train, its good to take at least second class or private couchette. Hi, I have been reading your blog and it’s most informative. I would like to know how much is the 8 day ticket in Vienna. Do they have lesser days’ ticket? Thank you for your info. Hi Ting – the 8-day ticket doesn’t mean it has to be used within 8 days – it has 8 strips – one validated strip can be used for a day and it can be shared with your travel companions. e.g. if you are travelling with 7 friends, your group could validate all the strips and use it for travelling around Vienna for a day. There are lesser day tickets e.g. one-day pass available too. Me and my husband are planning a trip to Eastern Europe and thanks for your blog, it provides me with lots of information and details. I ‘m still have no idea how to validate the 8 days ticket in Vienna. There are 8 strips numbered asending so each one of us take turn to validate the ticket from the bottom whenever we enter the mean of transports? The Mozart chocolate balls branded Mirabell are definitely better than the ones sold at Manner , though they look the same, but it is the taste that ultimately matters. Suggest Manner shop for buying for gifting purposes, but if you want the best buy the ones labelled “Mirabell” at Sconbrunn or Dutyfree shops at the airport. Just to let you know, the mozart balls and manner can be bought in any of the supermarket in Austria, which can be cheaper than those blood sucking touristy shops.